Wassim Haddad is at Ericsson Silicon Valley where he currently works on distributed cloud infrastructure. Heikki Mahkonen and Ravi Manghirmalani work at Ericsson Research at Silicon Valley in the advanced Networking and Transport labs. The Ericsson team has a diverse background in different NFV, SDN and Cloud related R&D projects. The Network Function Virtualization (NFV) paradigm breaks away from traditional “monolithic” approaches, which normally build network functions by tightly coupling application code to the underlying hardware. Decoupling these components offers a new approach to designing and deploying network services. One that brings a high degree of flexibility in terms of separating their lifecycle management and enabling much more efficient scaling. Moreover, the move away from specialized hardware coupled with a “virtualize everything” trend is fuelling operators and service providers’ expectations of significant cost reductions. This is undoubtedly a strong motivation behind NFV adoption. Current NFV market trends point towards two key technologies: Cloud Orchestration (e.g., OpenStack) to provision and manage workflows, and Software Defined Networking (SDN) to enable dynamic connectivity between different workflows as well as network slicing. In parallel, there is also a strong desire to migrate from virtual machines towards microservice enablers, particularly Docker containers, to boost performance and hardware utilization. On the other side, it is evident that without intelligent and dynamic traffic steering between different VMs and/or containers, large-scale NFV deployments (e.g., for 4G/5G end-to-end slicing, virtual CPE, etc.) cannot take place. For this purpose, cloud orchestration and SDN have to coordinate their actions, which further complicates the overall architecture. There are multiple advantages behind adopting containers as they offer higher density, a single operating system, and faster startup/shutdown. However, the ever-growing kernel complexities and vulnerabilities, together with the requirement to ensure strong isolation between different applications, have been frequently cited as barriers to widespread adoption. Unikernels, which sit on a continuum with containers, offer a different approach. We built a new standalone software platform to unify automation, orchestration and the ‘stitching together’ of a designated set of NFVs. Our platform does not rely on current cloud orchestration or SDN technologies. Instead, the platform architecture goes beyond existing virtual machines and containers, by introducing the concept of ‘nanoservices’ using MirageOS unikernels. MirageOS is a library operating system written entirely in a type-safe high level programming language, OCaml. MirageOS restructures all system components as modules which are implemented as a set of independent libraries. Such decomposition enables programmers to select and link together only the set of libraries that the application requires, resulting in at least an order of magnitude reduction in code size and a correspondingly much smaller attack surface. The compilation of the modular stack of application code, system libraries, and configuration produces the so called ‘unikernel’. By applying unikernel technology in the NFV space, we constructed a set of specialized, highly secure and scalable ‘nano-NFVs’ that can be streamed into our next-gen cloud. Our nano-NFVs show higher performance compared to existing NFVs, and have a much smaller memory footprint (i.e., between hundred kilobytes to few megabytes). As one example, excluding configuration and memory channel setup, our nano-NFV boots up within 10-20ms and is automatically removed when the request is fulfilled thus, enabling ‘zero-footprint’ or ‘serverless’ clouds — whereby the service is available only when needed. Furthermore, our platform embeds intelligent ‘traffic steering’ capabilities achieved via shared memory circuits, which enable operators to slice their infrastructure as they wish (e.g., per user and/or per device and/or per flow). Currently, our NFV platform runs a DHCP server, Network Address Translation (NAT), and firewall services. Our platform is implemented in OCaml using the MirageOS development environment and uses a number of existing MirageOS libraries. The left side of the figure above shows how our platform can be implemented from a set of unikernel-based NFVs, with each having its own network stack. In this case, each NFV needs to be orchestrated beforehand and the virtual switch needs to have packet-forwarding rules, in order to support service function chaining. Our ‘Just-in-time summoning (jitsu)’ of NFVs implementation is shown on the right side of the figure. In this case, the only unikernel running a network stack is the Packet I/O unikernel, which needs to be orchestrated before incoming IP packets can be consumed. In fact, when the Packet I/O unikernel receives an IP packet, it checks first if a matching shared memory circuit exists for it. If a shared memory circuit has already been created, the packet is bridged to it for handling. Otherwise, a memory circuit can be created by utilizing the orchestrator unikernel. In such scenarios, IP packets are forwarded to the orchestrator unikernel which in turn, looks up the subscriber policy in the Irmin datastore then creates a dedicated NFV unikernel for the specific IP flow defined by the 4-tuple: (IP source address, source port number, IP destination address, and destination port number). For example, if the received packet is a DHCP request, then a DHCP server is created and connected to the Packet I/O unikernel via a shared memory circuit. 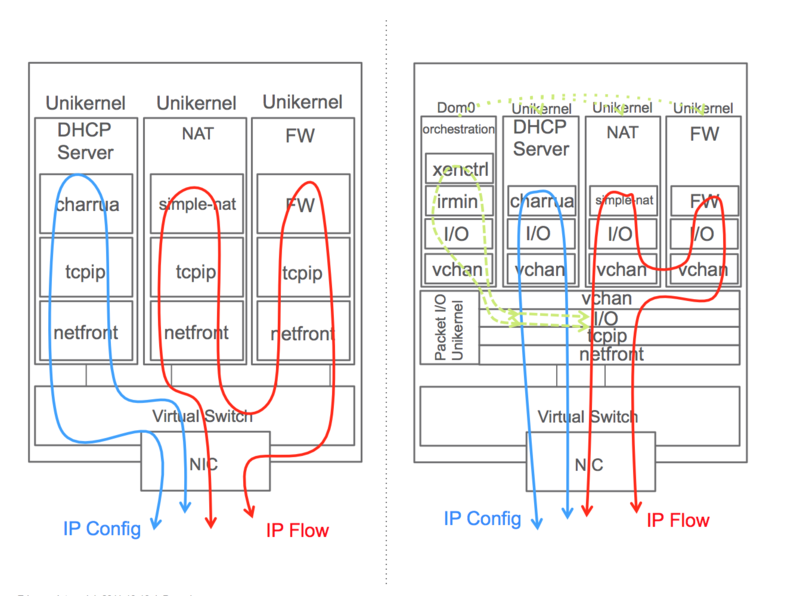 If the packet belongs to a different IP flow, a service function chain is created by stitching together NAT and firewall unikernels with shared memory circuits. Once the set of dedicated NFVs is setup, packets belonging to the corresponding IP flow are pushed back to the Packet I/O unikernel, which forwards them to the just-in-time created memory circuits. In the reverse direction, packets received from the shared memory are bridged to the networking stack then sent out to the network interface. Our NFV platform implements the shared memory by using the vchan library, which enables connecting two Xen domains to each other with a bidirectional memory channel over which bytes can be sent. We also implemented framing to enforce IP packet boundaries through the shared memory. In order to connect domains with vchan memory circuits, Xenstore is used to configure endpoint domain IDs. Each unikernel reads the domain ID on boot up time, which ensures that the platform is immutable. If circuits need to be changed then associated NFVs need to be restarted and configured. The immutability aspect underlying our platform architecture allows assigning dedicated pre-configured unikernels to serve a particular user. This means that once instantiated, these unikernels will process packets according to their original configurations, i.e., the one available at compile time. Any attempt to re-configure a unikernel at runtime will result in re-compiling and re-launching the unikernel. Our NFV orchestrator is running on Xen Dom0 and uses the Irmin and Xenctrl libraries to implement just-in-time summoning of NFVs. Irmin is used to store and retrieve the subscriber policies when new NFVs are required to process incoming packets. As the orchestrator is running on Dom0, it can use the Xenctrl library to create and destroy new unikernel domains on demand. The orchestrator unikernel consists of OCaml code that handles packet I/O and framing from the shared memory, binding to the Irmin datastore, creation of new unikernels, and periodic garbage collection for idle unikernels. To determine idle unikernels, the Packet I/O unikernel stores a timestamp for packets forwarded to memory circuits. The orchestrator compares this timestamp to a threshold and if needed, unikernels can be deleted. We implemented a CRUD API for the Irmin datastore to retrieve and update subscriber policy records. This API provides simple utility functions, e.g., find_subscriber, get_mac, get_service. Inside the API, these functions use the Irmin API to connect to the actual datastore. The DHCP server uses the charrua-core DHCP server library. DHCP configuration is passed to the server through Xenstore. Packet I/O is done through a single vchan memory circuit that is connected to the Packet I/O unikernel. DHCP Requests received are passed to the charrua-core library by using the Dhcp_server.Input.input_pkt function. This function returns DHCP Reply packets, which are forwarded back over the vchan memory circuit to Packet I/O which pushes them down the wire. For NAT, we are using the simple-nat library that handles TCP and UDP flows (for ICMP testing we implemented simple IP translation mechanism). The NAT unikernel has two memory circuits one for uplink and one for downlink direction. Packets are passed between these circuits and in between passed through the simple-nat library by invoking the Nat.translate function. For ICMP flows, we do the IP address rewriting in place in the vchan receive function. Currently, in our proof of concept, the firewall is a simple pass-through NFV but our plan is to use the QubesOS unikernel firewall as a library. The unveiling of our lightweight NFV proof of concept was in January, 2016, at the 14th annual Southern California Linux Expo (SCALE 14x) in Pasadena, California (slides, video). A post with other details is available on the Ericsson Research blog. Our results in the figure below show creation, boot up, configuration and memory channel setup times that are around tens of milliseconds for typical NFVs such as a DHCP server, NAT, and firewall. In addition, our approach enables service chaining between NFVs without having to inject complex rule sets in the virtual switches. Also, the resource requirement for NFVs could be kept to a minimum since only a single vCPU and a few tens of MB of memory were required for each service. Note that a recent study showed that it is possible to further shrink the NFV image size to less than 10MB. Upcoming work on dead code elimination in OCaml will also provide immediate impact with minimal effort, aside from upgrading the compiler — a key benefit of clean slate unikernels. We believe unikernels are well suited for adoption by the new emerging class of IoT and 5G applications, primarily because of their smaller, more secure memory footprint. These features mean that network providers will be more open to hosting third party applications at various points in their network and to monetize low-latency guarantees, geo-local information and personalized customizations. New distributed computing paradigms, software abstractions, and methodology for service and network function compositions will emerge because of the fact unikernels can be activated in a relatively short duration resulting in greener datacenters. We are investigating areas which can profit from the capabilities offered by unikernels. We believe this could bring in a new era of telecom innovation and accelerate the adoption of third party value added services. Thanks to Amir, Mort, and Anil for their comments on earlier drafts.